The Aussie four-piece will play a gig ahead of the awards ceremony, which takes place on 6 September. 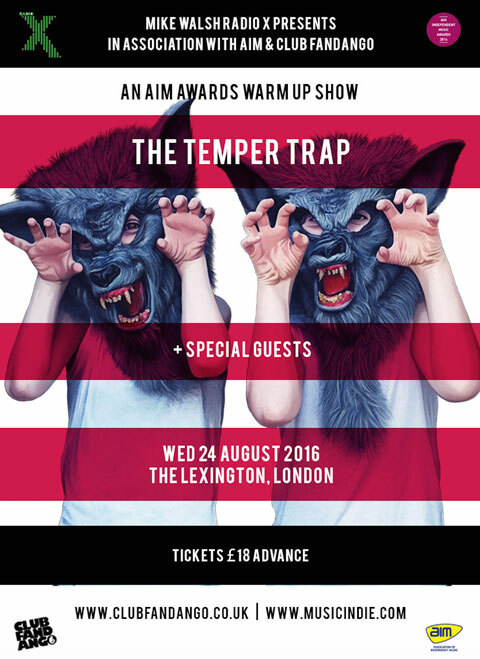 The Temper Trap will perform at the AIM Independent Music Awards warm-up show, hosted by Radio X's Dan O'Connell. The Australian four-piece will be joined by special guests at The Lexington on Wednesday 24 August, to gear up for the awards ceremony, which takes place at The Brewery in London on 6 September 2016. Tickets go on sale on Songkick and Dice, tomorrow from 9am, BST. The AIM Independent Music Awards - which will be presented by Radio X's John Kennedy this year - seeks to recognise the "real heroes of music". This year sees the likes of Wolf Alice, Sunset Sons and Father John Misty nominated for Best Live Act, which music fans can vote for. Visit the AIM Independent Music Awards website for more information.